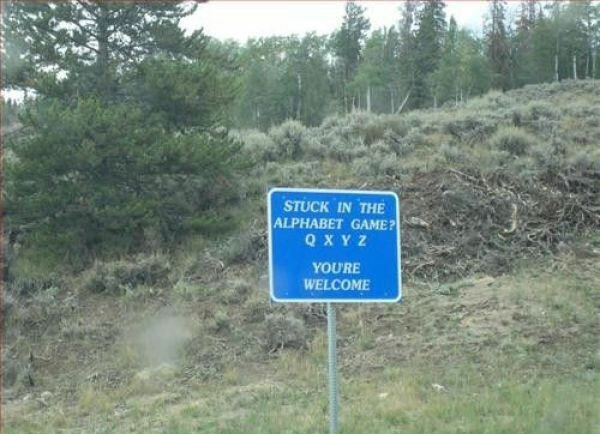 Each player attempts to find the letters of the alphabet, in order, on road signs or nearby buildings. Letters on movable vehicles (e.g. trucks or license plates) cannot be used. If the driver is playing, signs cannot be used once they have been passed for safety reasons. The first player to find all the letters of the alphabet is the winner. Created about 7 yrs, 25 days ago (March 23, 2012). Updated about 7 yrs, 25 days ago (March 23, 2012).